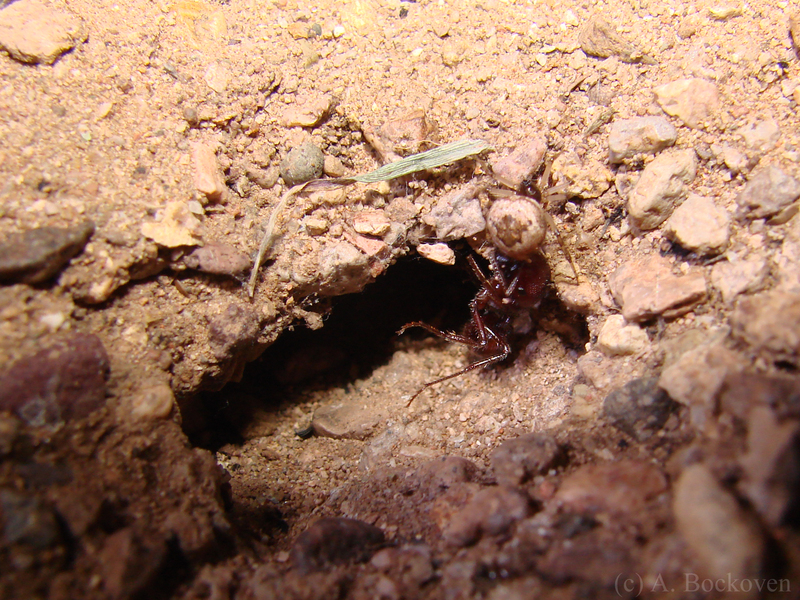 Spiders slip inside a sleeping harvester ant nest to prey on the worker ants. 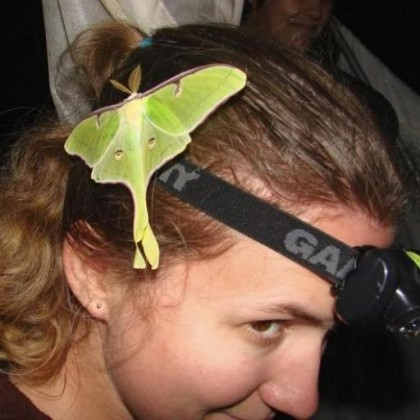 Last week I had the pleasure of attending the new Ants of the Southwest course at the Southwest Research Station in Arizona, and I thought I’d jump right and share with you my favorite entomological encounter. While black lighting in the desert we happened across a harvester ant nest that was being raided by dozens of small hungry spiders. The spiders would slip inside the nest entrance individually and emerge some time later, dragging worker ant prey. It was pretty impressive to watch, particularly as there was no evidence that the spiders’ raiding was provoking any kind of response from the colony. Harvester ants (or “pogos,” from Pogonomyrmex) are a group of ants with a fairly vicious sting, and the workers dwarfed their tiny spider predators. I’ve included more pictures as well as a video below, with bonus excited chattering commentary. 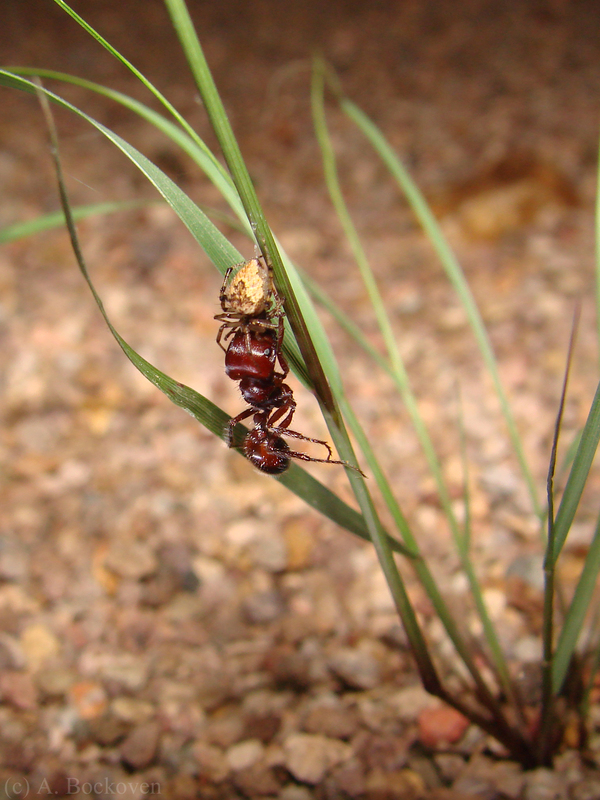 A spider drags its harvester ant prey from the sleeping nest. I don’t have an ID for the spider as of yet. Several group of spiders are known to mimic ants, either to help them obtain prey or to help them avoid predators. If these spiders don’t look like ants to you, it’s possible they may smell enough like ants to fool the colony. Cosmophasis jumping spiders use this scent-disguise tactic to enter weaver ant nests and prey on workers and larvae. Meanwhile certain spiders in the genus Masoncus take this a step further and live only inside harvester ant nests, where they prey on another nest symbiote, collembolans. A spider hangs from a grass blade, feeding on a harvester ant many times bigger than itself. Thanks for the feedback here and over at Bugguide. These spiders appear likely to be members of the family Theridiidae and the genus Euryopis. Many members of this genus appear to be specialist predators of ants. I poked around in the literature and there are a couple of papers about the species E. coki, a specialist predator of another species of harvester ants, Pogonomyrmex owyheei. (I believe the harvester ants pictured above were P. maricopa.) There were a number of similarities to the behavior I observed. E. coki was observed to lurk outside nest entrances and ambush ant workers, first tacking down a leg with silk and then biting the ant. When bushes or grasses were nearby the spiders employed a dangling feeding behavior (Porter and Eastman 1982). Dale Ward has a great shot of a male Euryopis mating with a female spider near the nest entrance of P. rugosus. 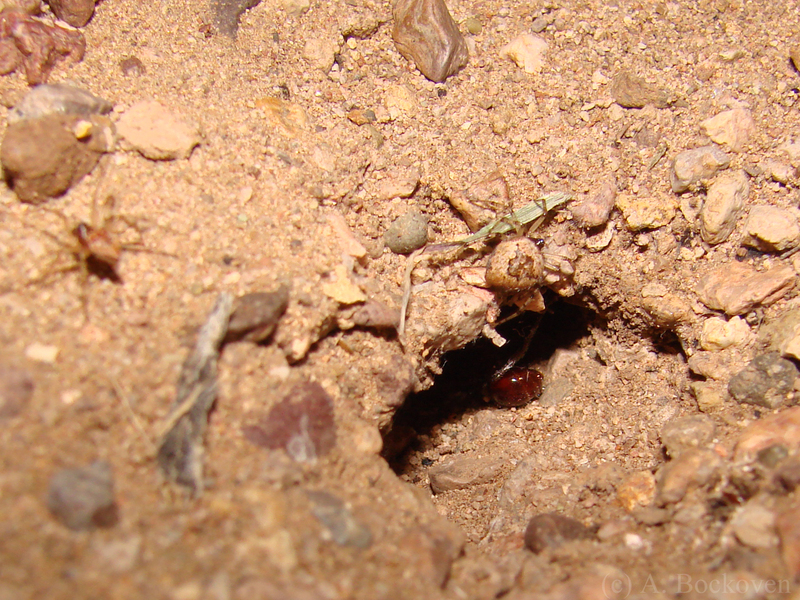 Tetramorium’s Ants of Arizona page also has some great shots and info. I haven’t been able to find any literature on thespiders actually entering the ant nests, though. Nice shot. Euryopsis is indeed the genus people have been telling me these spiders are. It looks most to me like Euryopis. The way it was capturing the ant did suggest Theridiidae. Awesome; thanks for the feedback. Looks like Euryopsis coki is know to hang around outside pogo nests. Wow! That picture of the spider feeding on the ant is amazing! The ant is three times his size!